FCF has changed! I think there are way too many great characters out there to limit them to just books so start talking about your favorite characters from movies, tv shows, AND books. Show me your favorites! 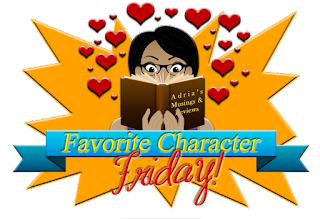 Favorite Character Friday is a weekly meme hosted by Adria's Musings & Reviews that gives readers a chance to celebrate their favorite characters, because with millions of books, tv shows, and movies out there and more coming out constantly, characters are like potato chips, you can't have just one. How it works: Every week highlight one of your favorite characters. Be sure to include where they’re from (Book, TV Show, Movie) as well! Share the love and maybe someone will check it out and see why that character is one of your favorites! Unlike the Book Boyfriend meme (which was a great meme), your Favorite Character Fridays choice can be male or female and can be from TV or Movies! 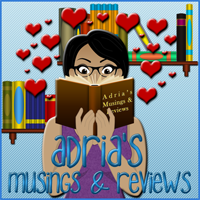 Be sure to link back to Adria's Musings &Reviews and share the link via the linky widget below. Why is this character your favorite (Feel free to include a favorite quote or scene)? Since the beginning of the 1797 series Matthew has been a specter of a man that has been mourning the loss of his fiance. Although he loves his tight knit group of friends, that loss sets him apart and made him into a tragic figure. Out of the group, he seems to be the most capable of loving whole heartedly and marrying for love. I say “seems to be” because the series isn’t over yet but Matthew’s capacity for love and his loyalty to his friends makes him one of the best characters in the series. In fact, in The Duke of Nothing he offers to marry the heroine, Helena in order to save her from an abusive uncle even though she is in love with one of his best friends who at that time was poised to marry Helena’s bratty cousin. Matthew’s a chivalrous guy and he has had a very eye opening experience that offers him a clearer view of marriage and love. “Her uncle is…cruel. Hateful. I don’t know if he’s hurt her, I do think he might be capable of it.” Baldwin clenched his fists as he thought of how enraged Shephard had been at Helena when he intervened. Baldwin jerked his gaze to Matthew. Tyndale was standing, his arms folded across his chest, staring at Baldwin with…challenge to his gaze. “Don’t even joke,” Baldwin said. And of course, Matthew doesn’t have a misogynistic view of women, he doesn’t judge them for seeking out pleasure, and he is definitely a staunch supporter of the “No Means No” club. Her attacker’s eyes narrowed farther. “You work for Rivers, then?” he spat. He shouted the last over the stranger’s shoulder toward Isabel, and she turned away in embarrassment. Matthew Cornwallis, Duke of Tyndale, once loved a woman, but she died in a tragic accident he felt responsible for. Since then, he’s been playing pretend that he isn’t broken inside, even as he’s seen as London’s most sought after bachelor. He decides to drown his sorrows at the notorious Donville Masquerade where he encounters an alluring stranger who he spends the night with. Mrs. Isabel Hayes was married once to a man who did not inspire passion and she’s been curious ever since. She has no intention of taking a lover at the Donville Masquerade, but to watch the activities there, just as she has been for weeks. But once the masked stranger pursues her, she is swept away. Soon Isabel recognizes her lover for who he really is and realizes a terrible truth. She is the cousin of the woman he once loved and lost, and her family blames him for what happened. Driven by the passion they’ve shared, but also repelled by the stories she’s heard, Isabel continues the affair, trying to find the truth. But once Matthew realizes her identity, will he pursue her for what they’ve built, or only because she reminds him of what he lost? And will he survive to share a life with her at all? Share your Favorite Character Friday on your blog, Facebook or Tumblr but don’t forget to let me know so I can check it out!